There's one critical aspect of the Curtis Flowers case that we haven't looked at yet — the makeup of the juries. Each of the four times Flowers was convicted, the jury was all white or nearly all white. 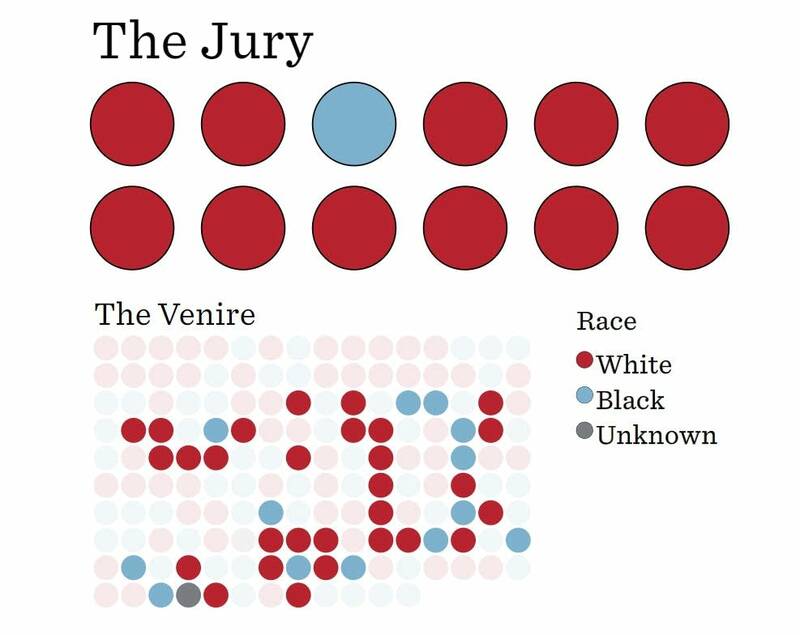 So we decided to look more closely at why so few black jurors had been selected. And it wasn't always happenstance. 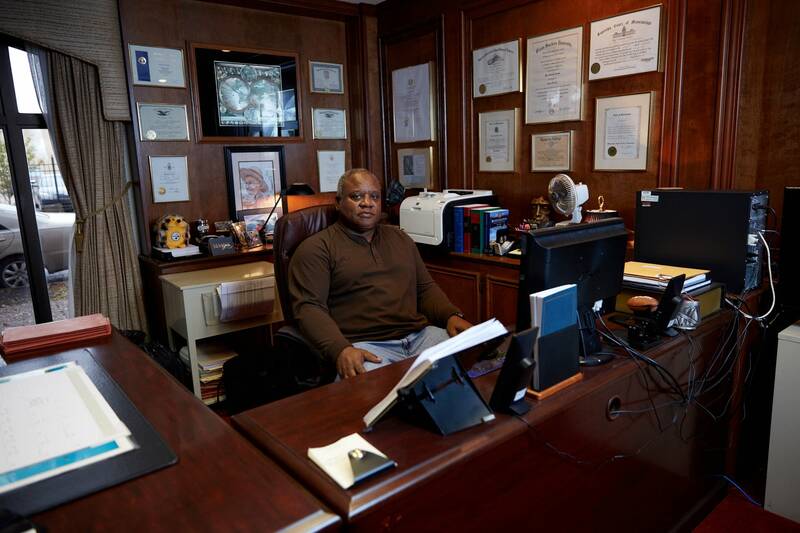 How did Curtis Flowers end up with a nearly all-white jury? The outcome of a trial can often hinge on who's sitting on the jury. In Curtis Flowers' six trials, a simple pattern has emerged. When the jury was all white, or nearly all white, Flowers was convicted. 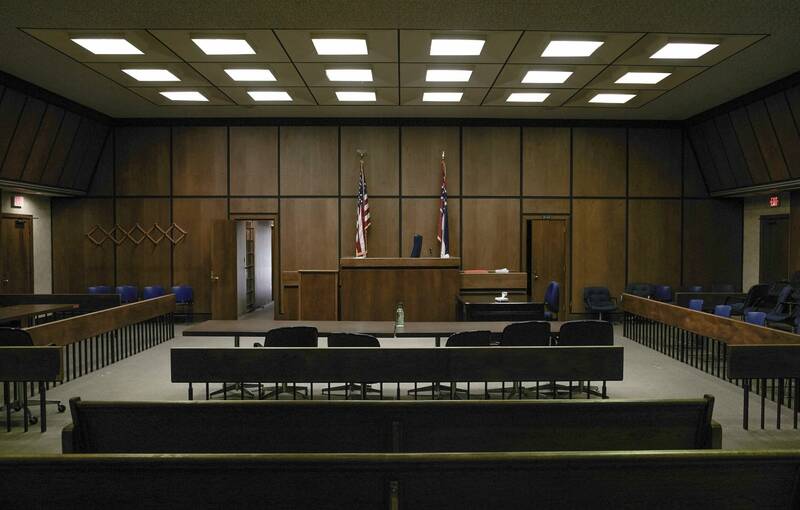 In the two trials that had more than one African-American juror, the result was a hung jury. His fourth and most recent conviction, in 2010, was handed down by 11 white jurors and only 1 black juror. That panel wasn't representative of Montgomery County's population, which is about 45 percent black. So how did it end up that way? How did Curtis Flowers get all-white or nearly all-white juries four times? Jury selection happens in three parts. First, a large number of jurors are called in, and the judge excuses those that aren't both legally qualified and able to serve. The remaining group of prospective jurors is called the jury pool or "venire." Next, the judge, prosecutor and defense attorney question the jurors, in a process called voir dire, and eliminate jurors who say they cannot be fair and impartial. Finally, the prosecution and defense take turns striking jurors they don't want. The first 12 people that make it through without getting struck are seated on the jury. The attorneys also choose a few extra jurors, called alternates, who hear the case but don't deliberate unless one of the original 12 has to be excused. Using the transcript of Curtis Flowers' sixth trial, in 2010, let's look at how the prosecution and defense used the rules of jury selection to shape the composition of the final jury. Due to the high-profile nature of Flowers' case, the court called in 600 potential jurors. After the judge determined who was legally allowed to serve, 156 remained in the venire pool. The process then unfolded like a game — the lawyers went back and forth, eliminating jurors. 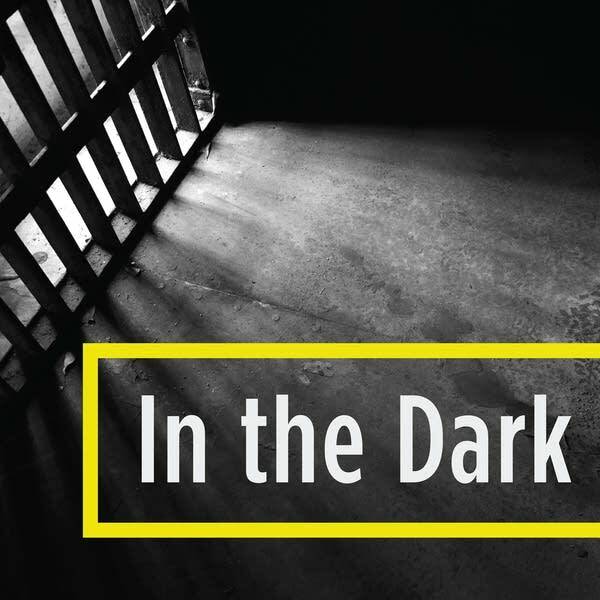 Explore how that pool of 156 was whittled down to 12 — 11 white jurors and 1 black — who would send Curtis Flowers to death row. 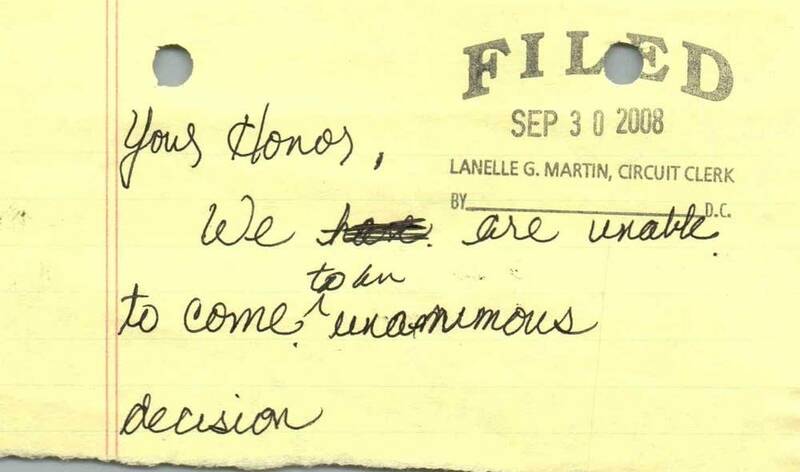 This is the note the jury sent to Judge Joseph Loper at the end of Flowers' fifth trial, which ended in a hung jury. Read other notes from the jury. When the jury in Curtis Flowers' fifth trial deadlocked, it was because of a single holdout, a black juror named James Bibbs, who didn't think there was enough evidence to convict. After a fraught jury deliberation, Judge Joseph Loper called the trial quits. As the other jurors filtered out of the courtroom, Loper accused Bibbs of having lied during jury selection by failing to disclose a fact he later brought up during deliberations — that he'd been at a lawn mower repair shop near Tardy Furniture on the day of the murders. TV news cameras caught — on tape — the heated exchange that followed. "In my eyes, you have committed perjury," Loper said, accusing Bibbs of trying to subvert justice. Flowers' attorney, Ray Charles Carter, also drew the ire of Loper when he made a move to leave in protest. "You have a seat, Mr. Carter," Loper shouted. "You have not been released. I don't know who you think you are." The judge threatened to hold Carter in contempt of court if he didn't apologize. The afternoon ended with Loper's order that Bibbs be arrested. Six days later, Bibbs was indicted on two counts of perjury. He hired attorney Robert McDuff (full disclosure: McDuff represented APM Reports in our effort to obtain public records in Mississippi). McDuff argued that the court should take special precautions to ensure that a holdout juror was not put on trial for the wrong reasons. "There is a significant danger when a prosecutor's office does what has been done here. ... This can chill jurors in the future from voting their honest convictions. This raises the specter that a juror is being punished for concluding there was reasonable doubt and for voting to acquit," McDuff wrote in a motion to dismiss the indictment. The case dragged on for eight months before District Attorney Doug Evans agreed to recuse himself, at the behest of Bibbs' lawyer, who argued that it was a conflict of interest for Evans to prosecute the former juror. The state attorney general's office took over and asked the court to dismiss the case. "It was such a shock and a surprise. I don't know what to think at this time, you know. I knew that, you know, I hadn't done anything wrong, so I didn't really worry too much 'cause I know what it was wasn't true." In the early morning hours of August 28, 1955, Roy Bryant, his half-brother, J.W. Milam, and perhaps several other people, barged into the Leflore County home of a black sharecropper named Moses Wright. In front of Wright's family, Milam and Bryant kidnapped his 14-year-old grand-nephew. The boy's fate would make him a lasting symbol of the horrors perpetrated against African-Americans not just in the Mississippi Delta but in the entire Jim Crow South. His name was Emmett Till. Till was visiting from Chicago. A week earlier, he'd arrived by train at the station in nearby Winona, just across the street from Tardy Furniture. 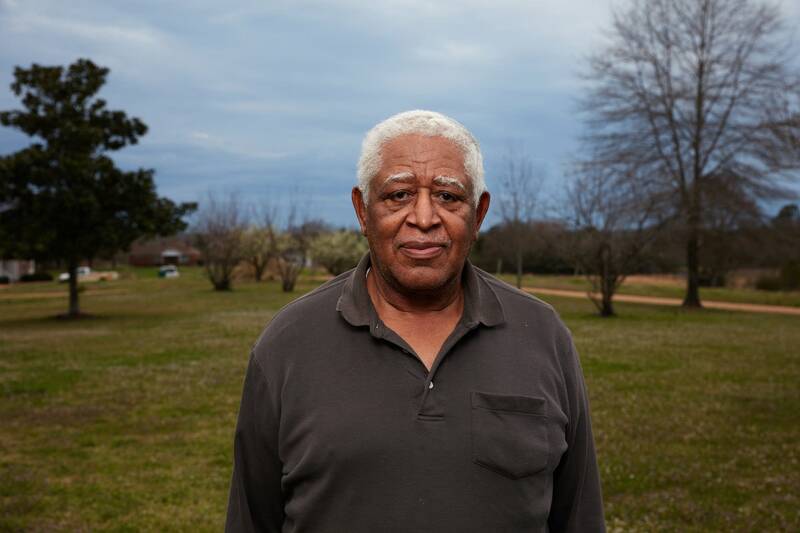 His troubles began when he and his cousins went to Bryant's Grocery & Meat Market, a white-owned store that served mostly blacks, in Money, Mississippi. There, Till apparently did something to offend Roy Bryant's wife, Carolyn, who was tending the store. Carolyn Bryant later testified that Till touched her hand, grabbed her waist and let out a "wolf whistle" as he left the store. In a 2007 interview with historian Timothy Tyson, Bryant said that parts of this account were false. Till had never touched her waist, not that doing so would have justified what happened next. Three days after his abduction, Till's naked body was found floating in the Tallahatchie River. His head was crushed — he'd been brutally beaten and shot — and he was tied to a 75-pound cotton gin fan with a piece of barbed wire that was wrapped around his neck. A ring on his finger had to be used to help identify him. Rumors spread quickly that Milam and Bryant were responsible. Several witnesses had seen the men take the boy from his family's home that night. Both men were questioned by police. While they confessed to kidnapping Till, Milam and Bryant claimed they'd later released him after Carolyn said he wasn't the one who'd "done the talking" to her at the shop. Milam and Bryant were arrested and indicted for murder. There were other witnesses. A young neighbor of Milam's family said he saw Milam, Bryant and several other men take Till to a barn that night and heard them beating him. A black man in town saw Milam at a gas station the following morning. Milam had something bulky under a tarp in the bed of his truck and blood was dripping from the tailgate. Meanwhile, Till's bereaved mother, Mamie Bradley, wanted her son's body brought home to Chicago. According to historian Timothy Tyson, Moses Wright negotiated the removal of Till's body from Mississippi by promising a local undertaker that he wouldn't, under any circumstances, open the coffin. But 625 miles north, Bradley had another idea. "Let the people see what they did to my boy," she reportedly said. Till's open-casket funeral drew a crowd of 50,000 by some estimates. Civil rights leaders seized the opportunity to decry a racist and violent southern culture. Pictures of Till's battered, unrecognizable face were printed in JET magazine and publications across the country. News of his hideous lynching led to outrage around the world. 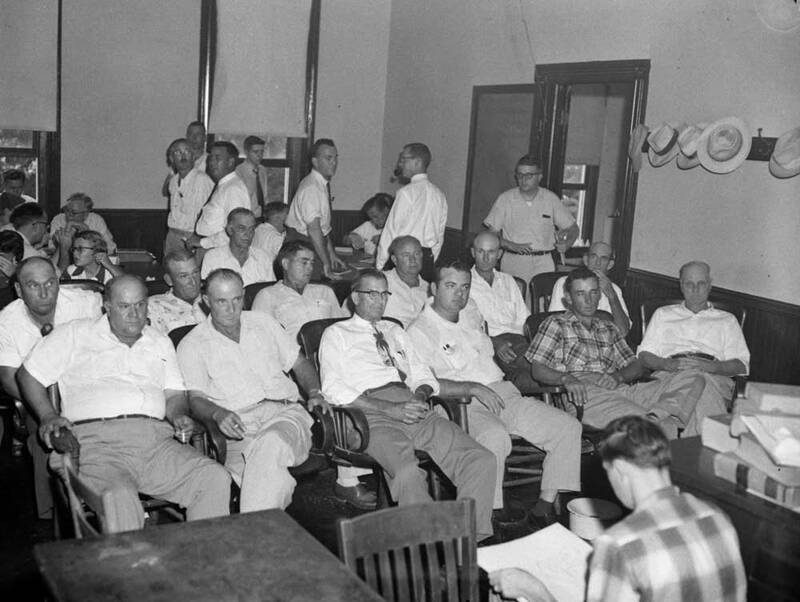 When Milam and Bryant were brought to court in September 1955, Mississippians groused that their entire way of life was being put on trial. Just a year after the Supreme Court had forced an end to school segregation in Brown v. Board of Education, Southerners were quick to bristle at what felt like more overreach from outsiders. "But I mean there wasn't no doubt that he was trying to get rid of all the black folks. That's exactly what he's trying to do."